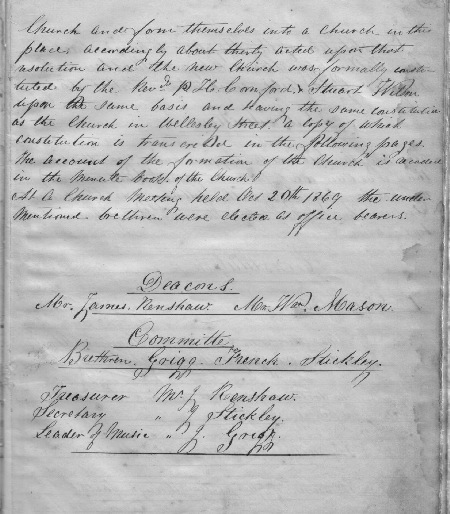 Highlights: From July 1868 several families who had previously worshipped with the Wesleyans began meeting as a Baptist fell owship in the cottage of Henry and Sophia Driver* on Hape St, seated on planks laid across old blasting powder barrels. They were lead by William ‘Daddy’ Mason, known for his flowing white beard and his bag full of bibles and writing gear with which he’d traverse the mining claims among the hills to minister to the miners; writing letters home for many of those who were unable to write themselves, and distributing bibles to those who could read. James Renshaw, mayor of Thames for 17 years, was brother to Sophia Driver and a foundation member of the church. In 1869 they were granted land by Te Hoterini Taipari and Rapana Maungaroa. This was the first instance of close cooperation between NZ Baptists and local iwi. Henry Driver’s orphaned nephew, Harry, was the first Baptist minister to be trained in New Zealand, working as a student pastor in Auckland from 1881. From 1889, without losing their Baptist identity, they shared buildings, services and minister with the Congregationalist church in Mary St. whilst keeping the older, Willoughby St. Property for Sunday School and other activities. This arrangement continued for 36 years. Thames has the oldest Baptist church in the Waikato / Bay of Plenty region. *Great Great Grandparents of the previous pastor, Roger D-B. 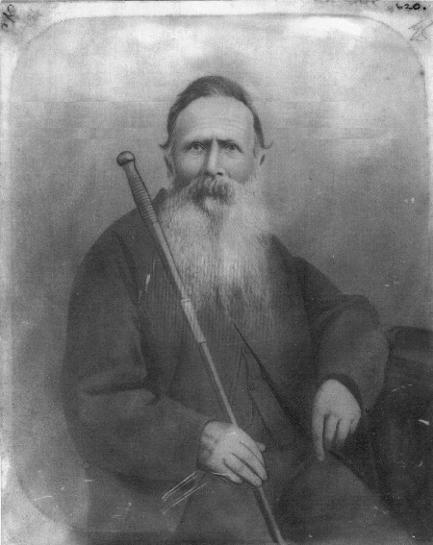 William 'Daddy' Mason arrived in Auckland in May 1863 at the age of 60. While in Auckland he served both the Auckland City Mission and the Bible Society. This latter work took him to outlying areas of Auckland where his sharp eyes, quaint speech and aged form supported by a long staff became well known to many. Economic depression in Auckland prompted Mason to move to Thames in 1867. There he earned a living by mining, but continued his mission work until re-employed by the Bible Society. In the absence of a minister, Mason preached regularly at the Thames Baptist Church for about a year. From “A Handful of Grain: The Centenary History of the Baptist Union of New Zealand, Vol.1 – 1851 – 1882” by Paul Tonson. 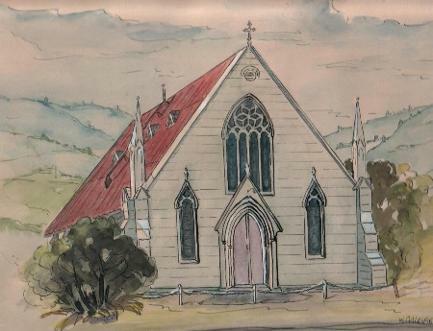 A water-colour of the Mary St. building before the church lounge was added on to the front. On the right of the building we now have our community ministries building, and there is a service lane on the left. he Thames goldfield opened on the 1st of August 1867 and from the beginning there were Baptists working here. Some were miners and others were in business. The minister of the Auckland Baptist Church had challenged the unemployed men of the church to go and work at the Thames since there was no work offering in Auckland. The challenge was to discover Christian ministry in a rough pioneering environment. This proved to be the beginning of the Thames Baptist Church. In July 1868 regular Sunday Services were held at the home of Henry Driver on the Hape Creek. The cottage was small and seating was planks between empty powder kegs. Violin players provided music. After a few weeks it was evident the venue was too small and so a building fund was quickly organised. A land grant from the Maori community provided a freehold property in Willoughby Street. At the 125th Anniversary of the church the descendants of Te Hotoreni Taipari and Raupana Maunganoa were invited to the celebrations and as a mark of gratitude were presented with copies of the new translation of the Maori Bible. The new church building was opened for worship on Sunday May 6th 1869. The building, which was basic, held 200 worshippers. At this time the church was a branch of the Wellesley St Church in Auckland but on September 27th 1869 the church was formally constituted with the installation of its first minister, the Rev. Stuart Wilson from Tarungulla, Victoria, Australia. This photo of the 'new' church building was taken at the time of the Diamond Jubilee in 1929, forty years after it had ceased to be used as the main place of worship for the Baptist congregation. The sign reads: "THE ENEMY OF THE RACE - ALCOHOLIC LIQUOR"
The first baptismal services for believers in Christ were held in the Kaueranga Creek. A Thames newspaper describes one such service in 1872 as follows,” Yesterday morning at seven o’clock a most interesting religious service was held on the banks of the Kaueranga Creek near the Maori settlement when six persons were baptised by Mr William Mason of the Willoughby Street Baptist church, Shortland. 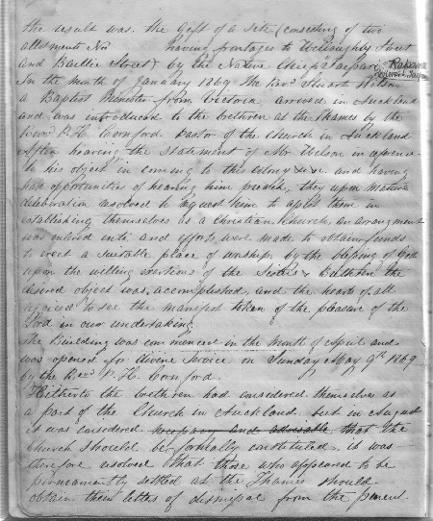 There were upwards of 200 persons present to whom the ordinance of Believer’s Baptism was explained and from the sacred scriptures as the only authority.” A baptistry was built in the Willoughby St Chapel in October 1874. The Provincial Government gave the water free for the first baptisms in the church – 6 candidates were baptised on 1st November 1874. As well as employing a minister, right from the start the Baptist church employed William Mason who visited the miners two days a week. He was very effective and respected in his work and became generally known as “Daddy Mason.” It could be said that this was the beginning of the Thames Baptist’s calling to community ministries. Apart from a period working amongst the railway workers on the new railroads in the Hamilton district, Mason was based in Thames. He died in 1879, at the age of 76 years, and was buried in the Shortland cemetery. With the slackening of the gold boom and the resultant decline in population the church began to see the need to centralise in Grahamstown which had become the centre of population and commerce. Under the ministry of the Rev William Woolley it was proposed, as a result of a congregational initiative, that the Baptists combine with the Thames Congregational Church using the Mary St Chapel as the main worship centre. The Shortland building then became a Youth centre. This union of churches became effective in 1889. In 1925 the Congregational Church discontinued the alliance and the Baptists purchased the property from the Congregational Union of New Zealand after the February 1926 fire destroyed part of the back wall of the building causing considerable damage. Later a kitchen and Bible Class rooms were added to the rear of the property. Celebrating the Diamond Jubilee of the church in 1929 twelve coloured glass side windows were installed as memorials to foundation members and early leaders. Family members contributed to the cost of these. The Friendship Centre was added to the front of the church during the ministry of the Rev Gavin Smith who became mayor of Thames. In the 1990’s the property next door to the Church was purchased to provide much needed space for the rapidly developing community ministries, and later a purpose built kindergarten was added at the rear to house the burgeoning kindergarten. The Thames Baptist Church took a keen interest in the development of the Coromandel Peninsula contributing leadership and members to Waihi, Paeroa (Ohinemuri), Te Aroha, Pauanui and Whitianga which now have active Baptist churches of their own. 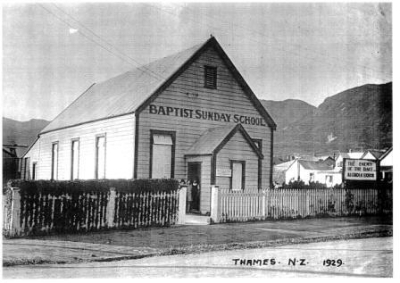 In 1882 Thames was one of the founding churches of the Baptist Union of New Zealand and through the years has played a part in denominational life. Locally cooperation with the other Christian churches has always been a priority. In the closing years of the twentieth century and the first decade of the twenty-first century commitment to Christian mission has been demonstrated in active involvement in community ministries. Three trusts, Koinonia, Ebenezer and the Rainbow Connection have served different needs in the community. With the developing of these ministries the church staff has expanded far beyond the original concept of a minister and part time visitor. Extracts from “In Search of the City of Gold” By the Rev Don Dickson, published for our 140th Anniversary, September 2009. This is available from the church office for $15.00 of can be sent anywhere in N.Z. for $20.00 including postage and packaging. 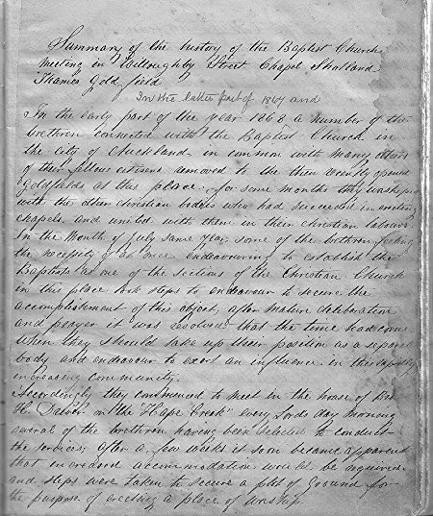 These scanned pages are the beginning pages from the first minute book of the church, begun in September 1869. After the list of church officers (see third page, below) the book continues with the core elements of it's confession of faith, before going on to list some of the clauses of its trust deed relating to the calling of meetings etc. Then follows the minutes of members' meetings over the first decade of the church's life and witness in Thames.